You drop out of law school. You’re a disappointment to your parents. You spend your days sitting on the couch (sofa) watching TV. That doesn’t sound like the start of a successful business, does it? However, it is the beginning of the unlikely road to success for Roy Choi. Back in 1996, Roy didn’t know what he would do with his life. Then, one day while watching the Food Network, a cable TV station devoted to (focused on) cooking and food, he got an inspiration (sudden idea). He wanted to become a chef (professional cook). He enrolled in a good culinary (cooking) school, and eventually worked his way up to chef at the Los Angeles Beverly Hilton Hotel, where many celebrity events take place. After he was fired from his next job, he decided to try something different. After cooking gourmet (high quality, made with a lot of skill) food in some of the best restaurants, he decided to take his cooking on the road — in a lunch truck. 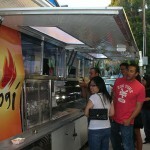 The lunch truck is a large truck with a simple kitchen that travels from place to place to sell food. Traditionally, in the U.S., lunch trucks sell inexpensive food, such as sandwiches and burgers, and travel to places with a lot of workers, such as near large business buildings or construction sites, where workers are doing the physical work to put up a building. Roy wanted to turn (change; replace) that traditional lunch truck food into gourmet food. Instead of unhealthy fast food, he would serve quick, cheap, and convenient gourmet food, and his specialty was a new type of cuisine that combined Korean and Mexican food. From these lunch truck, he sells unusual dishes such as kimchi quesadillas and (Korean) short-rib tacos. 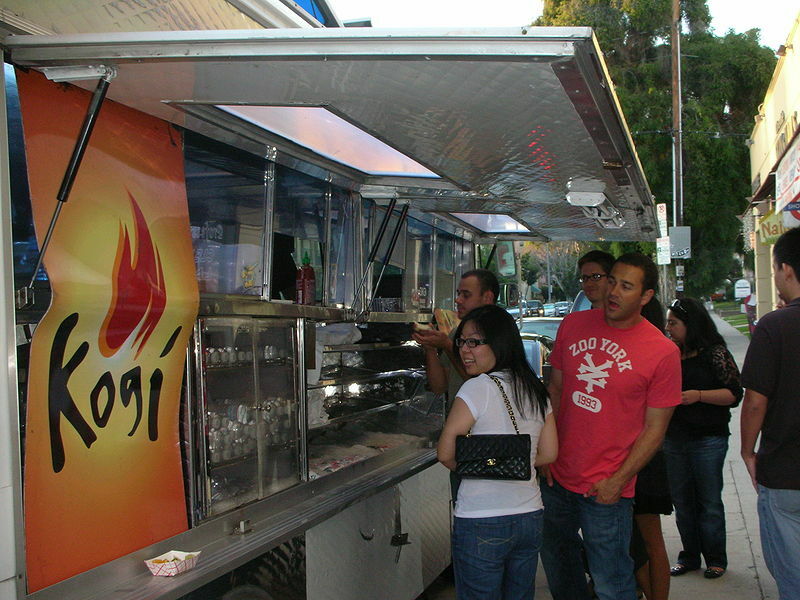 Soon after the Kogi trucks began traveling around Los Angeles, they became a cult hit (very popular with a small group of people). The owners of the lunch trucks used viral media to tell people where the trucks would park and serve. Viral media includes Twitter and Facebook, and is any type of electronic communication that can get information to a lot of people in a very short amount of time. An announcement would go out on Twitter about the time and location of the next appearance of the truck and people would flock to (many people would move quickly to) that location. Good food, cheap prices, cooked by a top chef — visiting these lunch trucks become the in thing (trendy; popular thing) to do. Even though I live in Los Angeles and have heard about these lunch trucks for over a year, I haven’t had the pleasure of visiting one yet, but I hope to soon. I want to know what Korean-Mexican food tastes like! Are lunch trucks popular in other countries? If not, are there special restaurants or food stalls (table or stands on the street) where people can go for a quick meal? Roasted Chestnuts in winter, of course, and sometimes we use them to worm our hands too. Some years ago Fried Churros were very popular, but now you may have them at the bars or just buy “churros” some little shops. Churros a nice for breakfast with chocolate or coffee with milk. food and people were hungered all the time. They were bought in the same way like roasted chestunts and the taste is quite sweet. Not other kind of food are sold here in Madrid´s streets, just a pity. or just get a chair near the place and ask for it to the waiter. Years before it was cheap, now it is very expensive and some times you do not have even a good attention. or little village you may go. It´s just our way of living that visitors enjoy very much. I would like to have something similar to “The Gourmet Lunch Truck” too, that´s for sure but we haven´t yet. I’m just watching “Come Dine with Me”. I think this would be great idea to randomly meet few people and have a gourmet lunch at their house. Hi Lucy, thanks for interesting story! In my country, this bussiness is, I think, pretty popular. In bigger cities, there are those Korean-Mexican-Chinese food stores at almost every corner. I love this cuisine! And I like how they treat you as a customer. They are always at your service and very kind. At least in most cases. So I wish to try that gourmet fast food you are talking about some time. It has to be even much better! That’s what success is made out of. Great idea! I’m sure that it must taste good! Here in Brazil we really enjoy these kind of mixtures. One example is all the kinds of pizzas( we have them with all sort of toppings you can imagine since Ice-Cream to Homemade Sun-Dried Tomatoes toppings) we have also here a lot of different kinds of snacks, both healthy and unhealthy ones! Well, I think that happens everywhere nowadays! i’ve recently heard that some people are setting small “restaurants” where you can buy delicious purées and salads . . my sister has gone to one which offers just 5 kinds of this types of dishes, so you can buy healthy food when you can’t go to your house to have lunch . . i think it’s a great idea !! . . and since it’s a small business, it must be easy to maintain . . i find it lovely that you can make a living out of cooking really good things for people that don’t have time for doing it for themselves . .
Hello Lucy. how are you? firstly, thanks for sharing this topic. I watched that kinds of lunch trucks biz on TV last time. I think it’s really good idea. and I’m proud of our food Kimchi which made with cabbage. in here we have lots of street foods like topokki (made with rice cake), skewered baked chicken with spring onion(lots of tasty). sweet strawberry skewer, pancake, a black bean-jam bun in the shape of a crucian in winter only, boiled fish paste etc…. I would like to share the wonderful taste! I think I’ve seen this truck on the TV program. The program is about the people who success in niche market. I was surprised people were waiting in line to buy his gourmet food. Here in Korea, we have lot of similar kind of trucks. It’s common. I don’t think they travel to place to place like him, but usually park their truck in some place and sell gourmet foods. There are many famous or well known trucks here. Nice to read you, an original topic. In FRANCE, we have a sort of truck like that. BUT you can only eat “chips and sandwiches”. It’s only for people who have no time to eat at lunch. It’s a poor quality food. But cheaper. I think the chef must get enough money to live with this job. It’s better to do that as staying at home all the day. Bye Lucy. Read you later. Hi ! We do not use lunch trucks in Romania. And gourmet food in a lunch truck? Who can afford to buy it with our salary? If we are in a hurry we buy a pizza, a fast food or… in our important cities we prefer Mc Donald for our health security. At Mc Donald everything is fresh and clean. We have special restaurants and food stalls especially at the seaside (The Black Sea) in summer time. There are Chinese and Korean restaurants only in our very important cities. We do not prefer the Mexican food. or a Frankenwine… In fact I do not know what a Frankenwine is. Oh! I’ve forgotten… the volcano ash from the air… Next time. In Vietnam, we don’t have this kind of gourmet food truck;instead, we have food carts of street venders.They pull the carts around the street and sell food which is usually traditional food.They usually stop by universities to sell to students, or at construction site to sell to manual workers because they may afford the cheap price of cart food. At the time when i was the student ,i did enjoy this food very much;it’s not only reasonable in price ,but also has good taste. One thing i still afraid is the cleaness of this type of food.Anyway, it doesn’t matter me so much. I hope the gourmet food truck would appear in Vietnam. interesting input. you killed me on the sput by the cult hit thing,good stuff. What else is new sis? It is not sth peculiar to US; every where you go by every school or construction site you see those trucks with foods reeking up the place. Hi! I was reading The New York Times when I saw Antonio Villaraigosa, the mayor of Los Angeles, together with the German Chancellor Angela Merkel. Unfortunatly, in our country, Kazakhstan, there are not such trucks. But we have a lot of different kiosks and sta shalls which sell fast-food, not only American, but more Caucasian 🙂 : samsa, uchpuchmak, pahlava and so on. It is the first time that I’ve heard of it.